Product prices and availability are accurate as of 2019-04-19 13:42:13 EDT and are subject to change. Any price and availability information displayed on http://www.amazon.com/ at the time of purchase will apply to the purchase of this product. 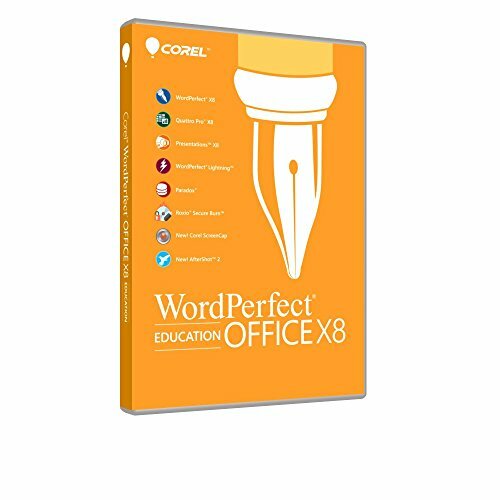 Corel WordPerfect Office X8 Education Edition for PC is an affordable and complete office documents solution. Create documents, presentations, spreadsheets, reports, and more with this all-in-one office suite. Enjoy full compatibility to easily open, edit, and share files in more than 60 file formats, including Microsoft Office (.docx, .xlsx, and .pptx). Built-in PDF functionality allows you to export and adjust file size and resolution for web, email, and print formats. Organize, edit, and improve your photos with AfterShot 2's intuitive controls. View document formatting with Reveal Codes, browse installed or created templates with the Template Viewer to start a new document, and create keyboard macros complete with a printable template.